Grow into the young man God wants you to be. Dig deep into God's Word and learn amazing new facts, discover inspiring people and stories, and uncover all kinds of stuff that you never ever imagined was in the Bible. Helpful, fun, and often downright astonishing, the NIV Boys Bible features unique and meaningful content. 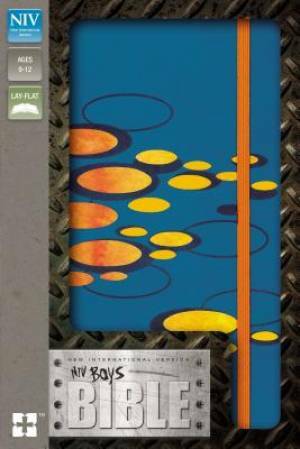 NIV, Boys Bible, Imitation Leather, Blue/Orange by Zondervan was published by Zonderkidz in October 2015 and is our 29546th best seller. The ISBN for NIV, Boys Bible, Imitation Leather, Blue/Orange is 9780310751106. Be the first to review NIV, Boys Bible, Imitation Leather, Blue/Orange! Got a question? No problem! Just click here to ask us about NIV, Boys Bible, Imitation Leather, Blue/Orange. When do you expect a Boys version of the NIV Bible with imitation leather cover, to be in stock? There are some nice ones out there but all in "girlie" colours! A:There are no dates as of yet for the Blue edition to be back in stock, but there is a NIRV Bible which is in blue imitation leather, and based off of the NIV text: https://www.eden.co.uk/shop/nirv-backpack-bible-4022003.html That is the closest I can find, and which is available. Thank you for using the Q&A Forum.